Most of the actions that you can perform in the Eggplant Manager user interface (UI) can also be automated by using the REST API. This ability could be useful if you want to automate the process of running tests or generating user data reports. For example, you could use the REST API to integrate Eggplant Manager into a continuous integration (CI) environment. There are many REST API methods available. The example on this page shows how to create a test, add a script to the test, execute the test, and check the status of the test run. The REST API uses HTTP basic authorization. 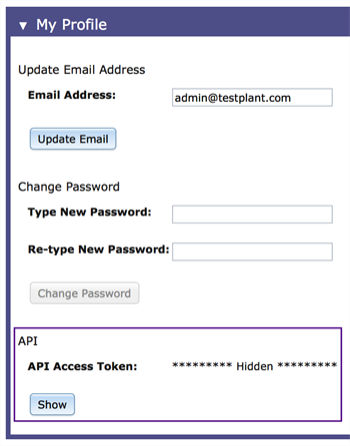 You can use Eggplant Automation Cloud or Eggplant Manager user credentials, or the API token found at Account > Account Settings in Eggplant Manager. When using the API access token instead of username and password, replace the username with the token, and the password should be randomly generated (or blank). The API Access Token on the Eggplant Manager Account Settings page. Note that the API Access Token field is hidden by default. To view this field, click the Show button. When the API Access Token field is visible, the Show button changes to a Reset button. If you click the Reset button, Eggplant Manager revokes the previous access token, then generates and displays a new token. If you're using cURL to run the API using the examples in the documentation, the access token must be base64 encoded. If you use Eggplant Functional, this script generates the access token in the appropriate format. Replace <token_string> in the script below with your API access token. The request body is a JSON-encoded version of the following. The name is required. The request body is a JSON-encoded version of the following. The script path is required. Note: Use _id from the test created in step above to add this test execution (script) to that test. Note: To add an additional test execution (script) to a test, another test execution must be created with a path to the script and then added to the test by using the same test_id. "_id": "<test run instance id>"
This topic was last updated on December 13, 2018, at 02:02:02 PM.